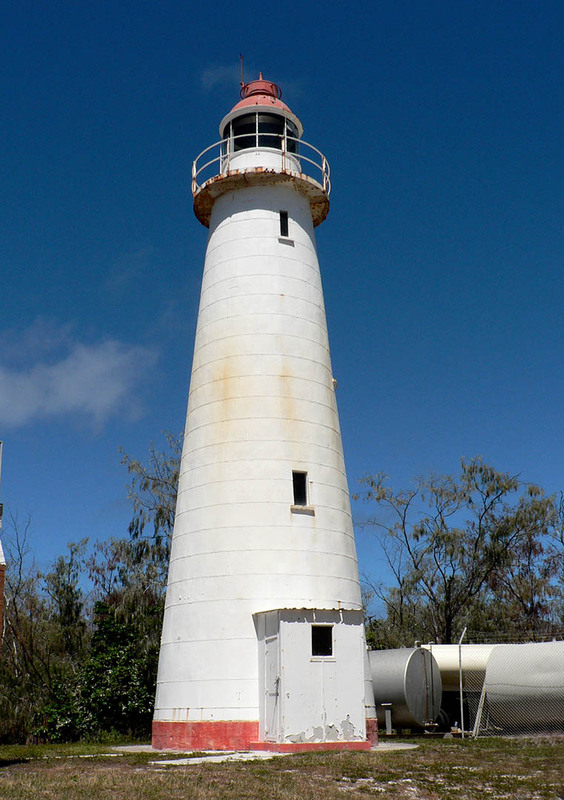 Lady Elliot Island Lighthouse | Lighthouses of Australia Inc. 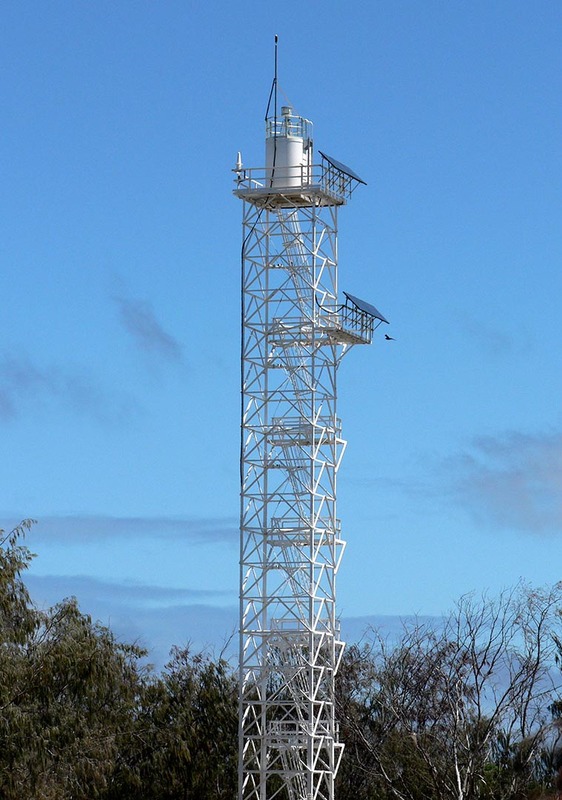 The Lady Elliot Island Lighthouse on the Great Barrier Reef is significant as it was the third completed in Queensland after separation from New South Wales. It was also the first built in Australia using a timber framed substructure and cast iron external cladding. A temporary light was erected there in 1866 which was in the form of a tall mast on which the light was exhibited. The light was erected in connection with the guano company mining on the island and blew away in a gale in 1871. 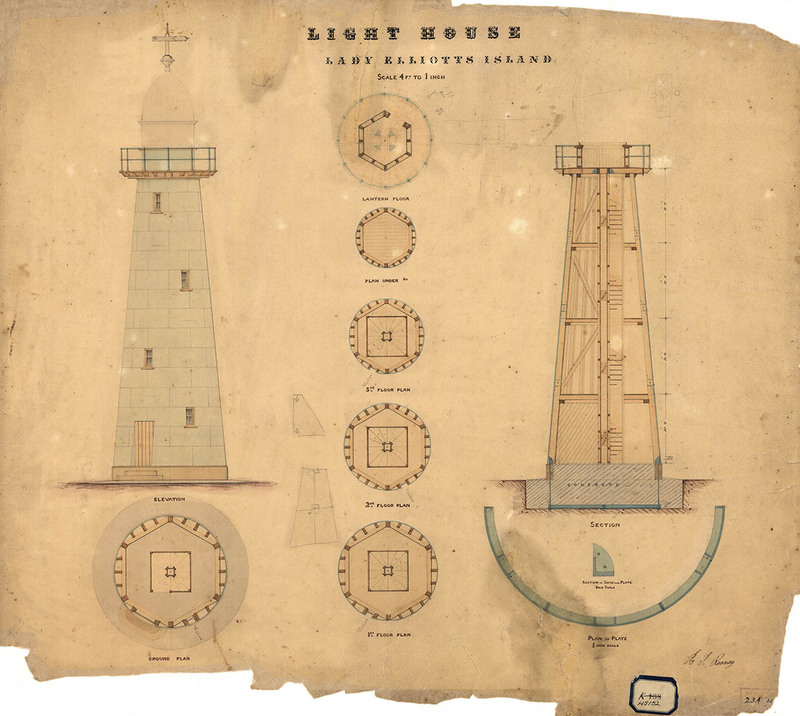 A new mast was erected and in 1872 plans were drawn up for the lighthouse. The light was originally a flashing white light of 4,000 candle power.This was increased in 1923 to 23,000 candle power and again in 1928 to 85,000 candle power. The pedestal was altered in 1928. 100 km from the coast, the 6 Hectares (15 acres) island, is a coral cay being only 2 metres above sea level. It is at the southern most point of The Great Barrier Reef. It’s name is given by the crew of the Lady Elliot, a British ship, who were the first to discover the island. Many wrecks surround the island and over the years, the keepers have assisted in many sea rescues. The island was badly deforested by the original guano mining, however much work has been done to restore the vegetation, mainly casuarinas (she-oaks), pandanus palms, and a few pisonias, which has brought back a large bird nesting population. Again the hardships of living on a lighthouse on such a remote island, and at sea, are brought to us by the two headstones enclosed by a low white picket fence. One is of the 30-year-old daughter of the first Lady Elliot lightkeeper. This young woman was born on the island and lived most of her lonely life there. She contracted pneumonia and despite desperate efforts by her parents, (stores ships at that time only called once every four months) died in 1896. The other is that of a turn-of-the-century wife of a ship’s captain who died at sea, but had earlier made her husband promise to bury her on terra firma (Lady Elliot Island being the nearest landfall).